Some 32 percent of all first-time jobs in the U.S. are in retail, according to the National Retail Federation (NRF), and despite recent inroads being made by online shopping, there are more of those jobs now than ever before. In a business too often characterized by folding sweaters and repetitively ringing up sales, retail can also offer the promise of career advancement — and challenge. 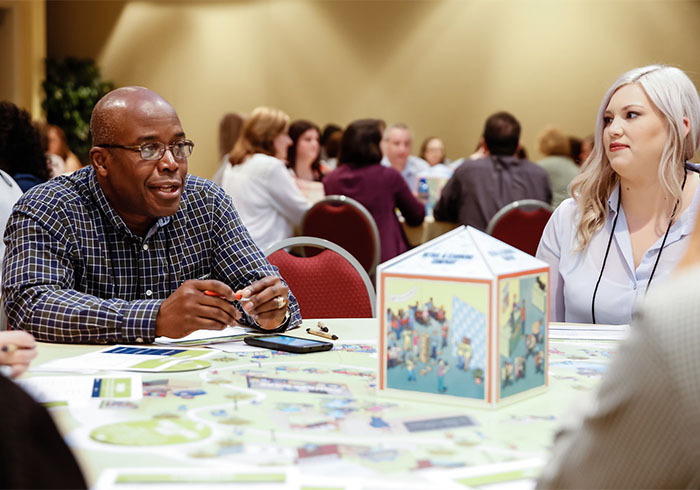 “The business has, overall, always been transactional — it has always been centered on the store — and the efficient running of that store,” says Kimberly Shearn, Director of Training and Development at Barnes & Noble College. As the company shifts from being solely a campus retailer to a more fully supportive campus partner, the training for our store managers is focused on leadership skills necessary to communicate and build strong relationships with their campus partners. The role of the store manager is pivotal to developing successful customer relationships and ensuring those roles reflect not only the interests of the company, but that of the campus. Shannon Johnston, Project Manager for Talent Development at Barnes & Noble College, explains why that’s so important. “Our store managers are really the ones who know their campuses and understand the needs of their students, faculty and administration,” she says. “The shift we’re making in our training is to encourage our store managers to tell our story — to get out of the store and engage — to better support our campus partners,” she says. That changed approach to training, now in place for the past year, is designed to give store managers the kinds of skills needed to better understand the needs of school partners and build the kinds of relationships that are so critical to the company’s success on campus. “We’re teaching them to better identify who their customers are — whether they’re a student, professor, parent or alumni — and to better understand their needs and wants, ensuring customers get what they need out of that interaction.” Regarding the manager’s interaction with campus partners, we are teaching the managers how to identify the needs of their campus and how to effectively communicate the solutions we offer that support such needs. In addition to the changes in training, store managers are also benefiting from other support tools. Project 770 research is providing managers with the opportunity to learn more about customer perceptions of the store and its role in college life, allowing store managers to not only make improvements, but use data as another opportunity to start conversations and build partnerships across the campus. I’m excited that B&N has a new development to have the company stand with the universities. It is about the next generation and not so much on where the company can go with revenue. When I was with the company, 8 years, I enjoyed getting to know the students, staff, and faculty. Truly exciting to see this new adventure. Thank you for your wonderful comment, Patrick. It’s always great to hear from our “alumni!” Developing and investing in great talent, as well as building relationships with our campus partners, drives successful outcomes. What has made our company a success for over 50 years – and sets us apart – has been, and always will be, our talented and dedicated people.